Famed British singer Rick Astley talks American politics, including how President Trump is being received in Great Britain. Larry King: What’s your take on the current political scene here? 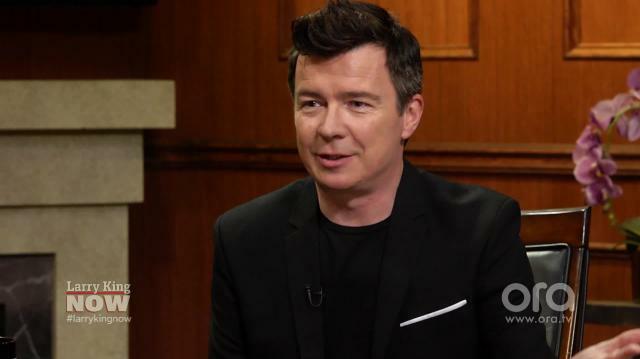 Rick Astley: It’s so fascinating to be here right now, to be honest. I was in America for a few weeks last year, the end of last year as well when you were building up to the election. It’s just amazing to me. I think Obama’s been an incredible President, and somebody who has been a global presence in the exact right way. And now you’ve got somebody who’s very, very different at home. Larry King: What do they think of Mr. Trump in England? Rick Astley: I think British people know him to be a TV personality, and we know him because he had all these properties and these golf resorts and this, that, and the other. You know, my hope is he’s gonna turn people around and he’s gonna do a good job. That’s all you can hope for, isn’t it really? Larry King: Is it true Melania, when she was making her speech at the convention, used lines from your song? Rick Astley: She certainly said some lines that were in that song. Whether she was quoting it, I don’t know. Well it’s the “Never Gonna Give You Up” song so ‘he’s never gonna give you up, he’s never gonna let you down.’ So I don’t know how far she went with it but I don’t know whether she was actually doing that but um yeah, kind of interesting. Larry King: I don’t think Michelle did that. Rick Astley: No, I don’t think Michelle did that, no.